SEATTLE — Washington’s governor and New York City’s mayor unveiled major initiatives to expand health insurance coverage Tuesday, the latest moves by key Democratic leaders to address Trump administration health policies they say are keeping people from getting the care they need. Washington Gov. Jay Inslee, a likely presidential candidate, proposed a publicly run health insurance option for state residents who are not covered by private employers and buying insurance off the marketplace created under former President Barack Obama’s health care law. “We need to write another chapter of health care reform,” said Inslee, who provided no details on how the program would be funded. A day earlier, California Gov. Gavin Newsom proposed state-funded health care coverage for 138,000 young people living in the country illegally and reinstating a mandate for everyone to buy insurance or pay a fine — part of “Obamacare” that congressional Republicans eliminated last year. The efforts in liberal strongholds target President Donald Trump’s push to roll back his predecessor’s signature law and are moves toward universal health care as championed by some Democrats. Health care was a top priority for voters in the November election, especially those who voted Democratic. 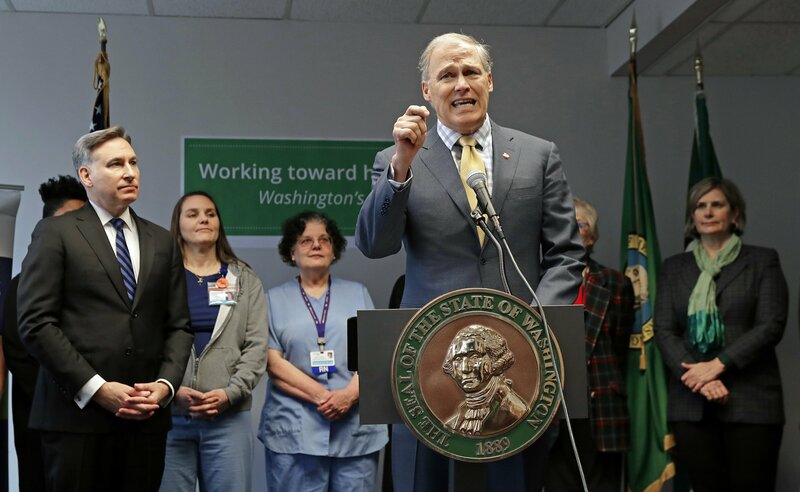 In Washington, Inslee included $500,000 in his latest budget proposal to begin the work of setting up the statewide program known as Cascade Care. It aims to help lower-income people who don’t qualify for federal assistance get coverage by 2021. Washington Insurance Commissioner Mike Kreidler said President Donald Trump’s administration has put up “real roadblocks” to health care access and that if the state’s public option is approved, it wouldn’t need federal approval. The Trump administration said in July that it would freeze payments under an “Obamacare” program that protects insurers with sicker patients from financial losses, which is expected to add to premium increases. Officials aren’t committing state dollars to subsidizing Inslee’s program but suggesting that premiums paid by consumers will support it. Insurance carriers and health care providers who participate in the program will also likely be squeezed. State Rep. Joe Schmick, a Republican, expressed skepticism that Inslee’s proposal could deliver without more taxes or health insurance costs.